Home » Latest News » What Makes Up a Tooth? 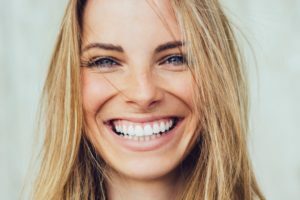 At Cosmetic Dentistry Center, we love teeth. We like our patients to know as much as possible about how to keep their teeth healthy and chomping away for their entire lifetime. That’s why we have blogs on things such as gum disease, plaque development, and such. But it never hurts to know the basics, either. Here’s a primer on your teeth, think of it as Tooth 101 if you were at UMass or BC. What are the parts of a tooth? Crown— This can be confused with a dental crown, a prosthetic that fits over your upper part of the tooth. The crown actually fits over the “crown” of the tooth. This is the portion of the tooth above the gumline. Gumline— This is where the tooth and the gums meet. When you develop problems with your gums, bacteria and tartar begin to move up under the gumline. Root— About two thirds of the tooth mass, the root is the part of the tooth that is embedded in the jawbone. Enamel — Enamel is the hardest tissue in the human body, but it is actually porous. That’s why it can accumulate stains from coffee and red wine. Enamel protects the inner tooth. Dentin— The layer under the enamel, the dentin has millions of tiny tubes that lead directly to the dental pulp. When a tooth is stained from a reaction to tetracycline or from trauma, it is stained in the dentin. This type of staining can’t be corrected with teeth whitening. Pulp— This is the soft center of the tooth. Here there are nerves and blood vessels. When decay invades the pulp you’ll begin to feel extreme pain. A root canal removes all of the nerves and blood vessels. Before a person loses any teeth, the normal number of teeth is 32, 16 on top and bottom. You probably have never spent much time thinking of the function of your teeth, but the different shapes make for different purposes. Here are the types of chompers in your mouth. Incisors— These are the sharp, chisel-shaped front teeth (four on top and four on bottom) used for cutting food. Canines— These are also called cuspids, these pointed teeth (two on bottom and two on top) are used for tearing food. Premolars— These teeth have pointed cusps on their biting surface and are also called bicuspids. These teeth (four on top and four on bottom) are for crushing and tearing. Molars— These teeth have several cusps on the biting surface. The molars (six on top and six on bottom) are meant for grinding up food. Now you’ve passed Tooth 101. The next time you’re munching on a dog at a Red Sox game, now you know which teeth are doing the cutting, tearing, or grinding. Is it time for your next professional exam and cleaning? Call us at Cosmetic Dentistry Center, (617) 965-7673, to make your appointment.